The Mattituck residence is an interior renovation of a colonial-style home in the North Fork of Long Island. The first floor of the home was initially composed of a series of traditional, enclosed rooms. The alterations involved the removal of the majority of the walls, the renovation of the kitchen and bathrooms, and the removal of extraneous decorative elements from the existing stair and fireplace. Two volumes mask the existing structure while providing architectural features complementing the client's enjoyment of the home - a custom wine rack at the dining room and custom wood cabinetry and storage that anchor the foyer and the playroom. 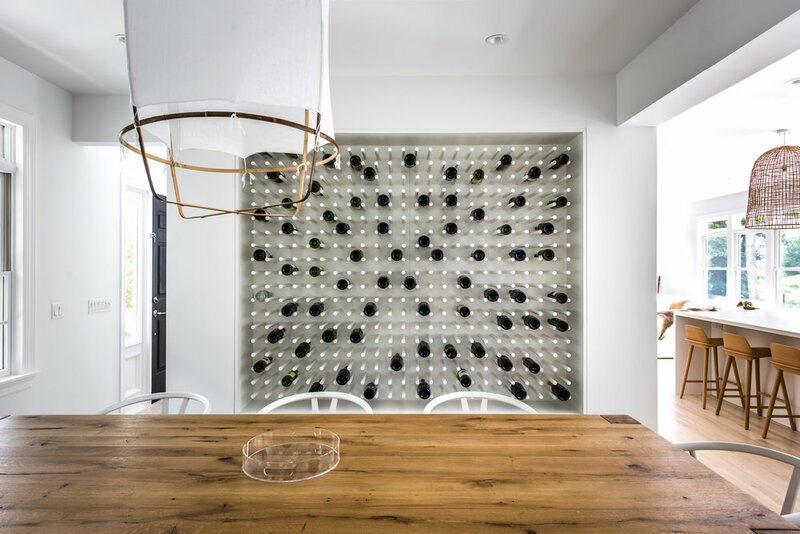 Two volumes mask the existing structure while providing architectural features complementing the client's enjoyment of the home - a custom wine rack at the dining room and custom wood cabinetry and storage that anchor the foyer and the playroom.